I've become somewhat of a lipstick collector lately (my latest phase/obsession). There's just something about a pretty new tube in a cute tiny box that excites me--it's now a favorite accessory! 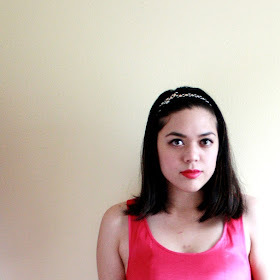 Lipstick just makes my outfits feel more complete and put-together. Here are the Too Faced and Kate Spade lipsticks I got over the summer. These new lipstick lines are wonderful, with shades that are pretty and refreshing, but still neutral enough that almost anyone can pull them off. Read on for details. 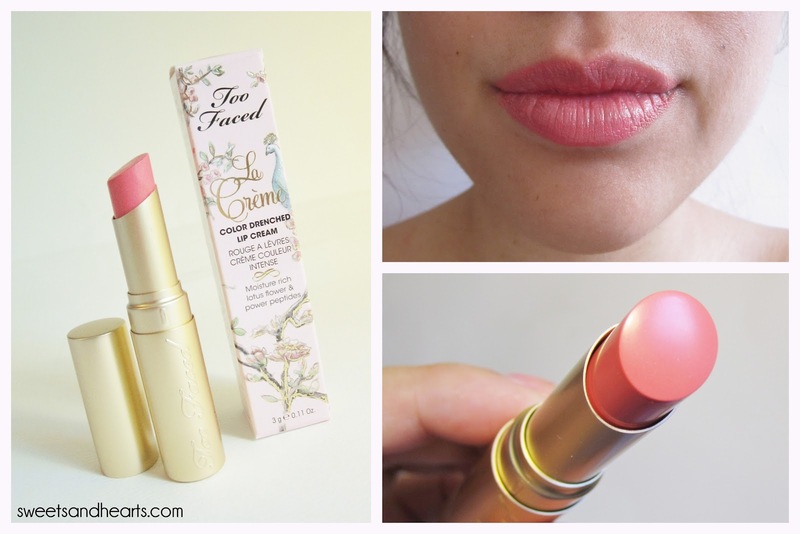 I love Too Faced's new La Creme lipsticks. The gold tube is sleek and weighty--it feels expensive (considering I got them for $21 each at Ulta, they should. Unfortunately, Ulta doesn't honor coupons on the "nicer" brands, which I found out that day. Darn.). The formula is smooth, creamy, and super moisturizing (but feel a little heavier than I'm used to). The colors are true, though not the most opaque. They show up really well though, last fairly long (I can wear it for a few hours before touching up) and don't bleed, which is awesome. The scent is a little too sweet for me--almost like frosting. The shades are mostly neutral and would work well on most skintones. "Juicy Melons" is a pale peachy pink coral. It's lighter than I'd normally get, but I tried it on in-store and loved it. The one thing I don't like about this shade is that it settles into my liplines a bit, so I usually wear it with a tiny bit of gloss. Exfoliate your lips beforehand and you should be fine. Here's the other Too Faced La Creme lipstick I bought: "Coral Fire". I LOVE this shade. It's a really pretty coral red--almost like a lighter brick red. It's not too dark, so it's become a go-to everyday color. 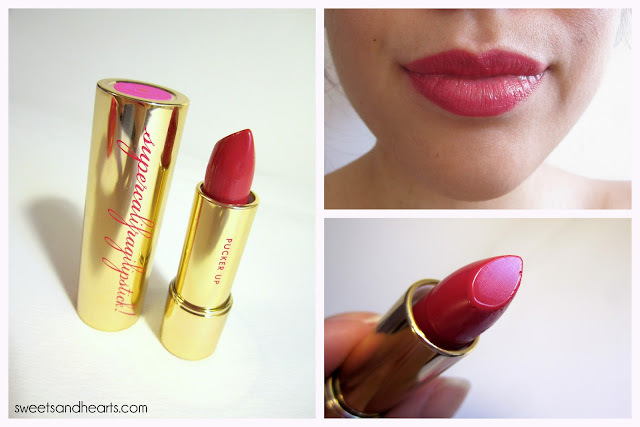 Unlike "Juicy Melons", this one doesn't settle into my liplines and I can wear it as is. I picked up Kate Spade's Supercalifragilipstick in "Parisian Pink" when I went to Las Vegas for MAGIC. I was torn between getting this shade and another, but settled on this one because it's unlike any shade I already own (although, I'm itching to buy the other one still). The shiny gold tube is so cute and says "Pucker Up" on the side. You push the cap and it pops off. It's not weighty like the Too Faced tubes, but still really nice. There are only a few shades available right now, but they're also neutral and would suit most skintones as well. "Parisian Pink" is a lovely deep raspberry pink. 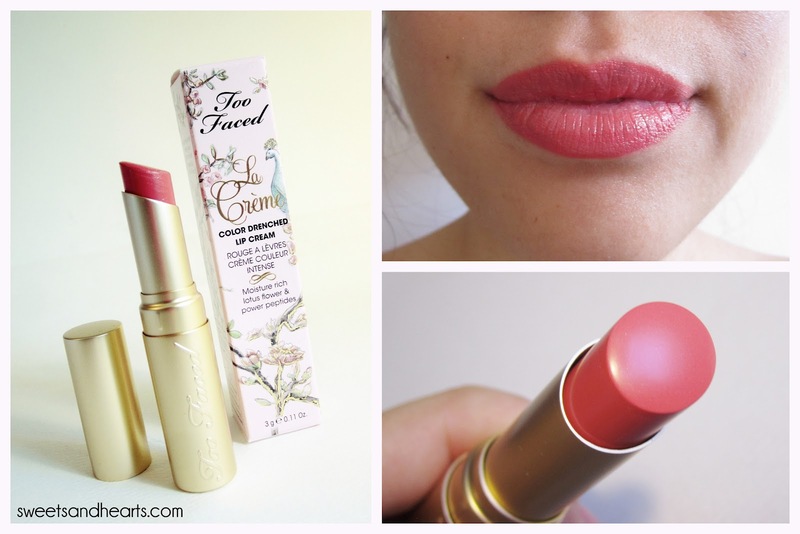 The lipstick is smooth and a little glossy--it feels so nice and lightweight on. Not completely opaque, but the color shows up nicely. It doesn't last as long as the Too Faced ones though, and bleeds if I wear gloss over it. Wear it by itself and touch up as needed.